If you are a bride or groom to be getting married in Kuwait and searching for a large ballroom to hold your wedding you are in the right place. 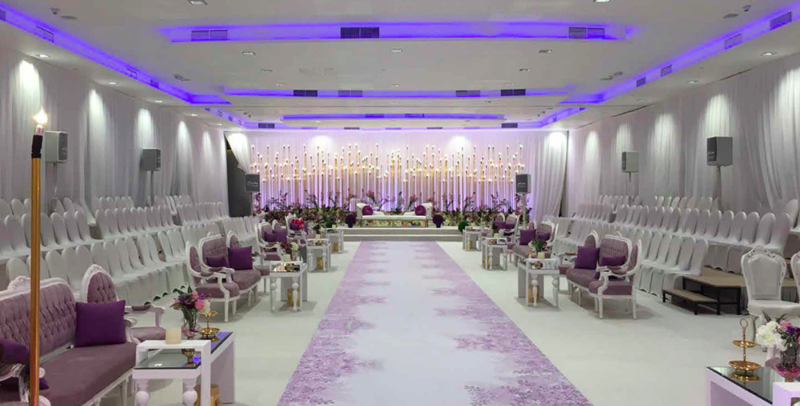 Whether you are considering having your wedding at one of the top hotels in Kuwait or at a banquet hall, we have done the research for you and produced this list of the largest wedding venues in Kuwait based on their capacities to host a seated wedding in banquet style. Banquet style is the most common setup for weddings serving meals, using 60" round tables with up to 10 chairs around each table. For more hotels and wedding venues in Kuwait click here. One of the largest ballrooms in Kuwait, the Arraya Ballroom is managed by Marriott International and provides unparalleled facilities. With its own access driveway, state of the art facilities, parking for over 1,000 vehicles and world-class banquet offerings, the 1,482 square meter ballroom is dividable into 6 subsections of various customized sizes, if needed. 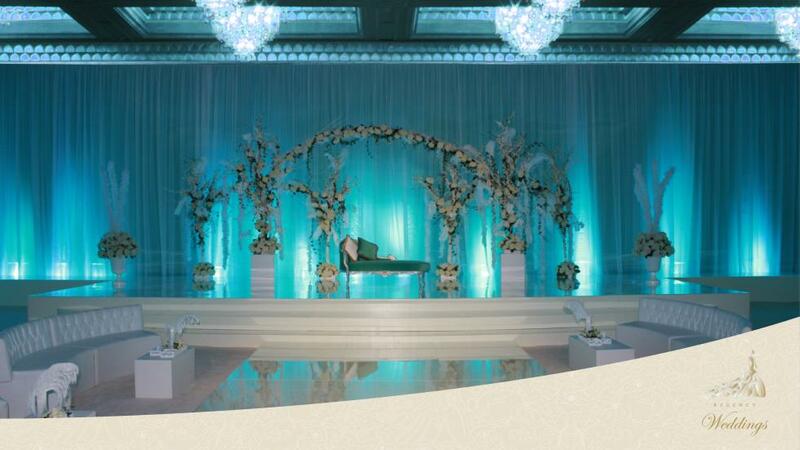 Arraya Ballroom, the epitome of luxury and elegance, is the most popular and prestigious wedding venue in Kuwait. It is located adjacent to the Marriott Courtyard Kuwait City. Their impeccable table setup styles, impressive facilities, two large screens, wireless connections, high-speed Internet access... provide you with everything you need for your wedding. Your guests will be welcomed like royalty with the spacious foyer's direct entrance from the driveway. 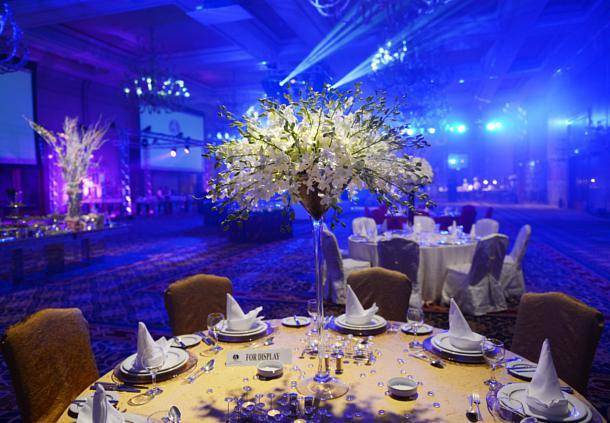 Accessing Arraya Ballroom is fast and easy, with a professional valet parking team. Four Seasons Kuwait combines modern glamour and attentive care for each bride, groom, and guest. 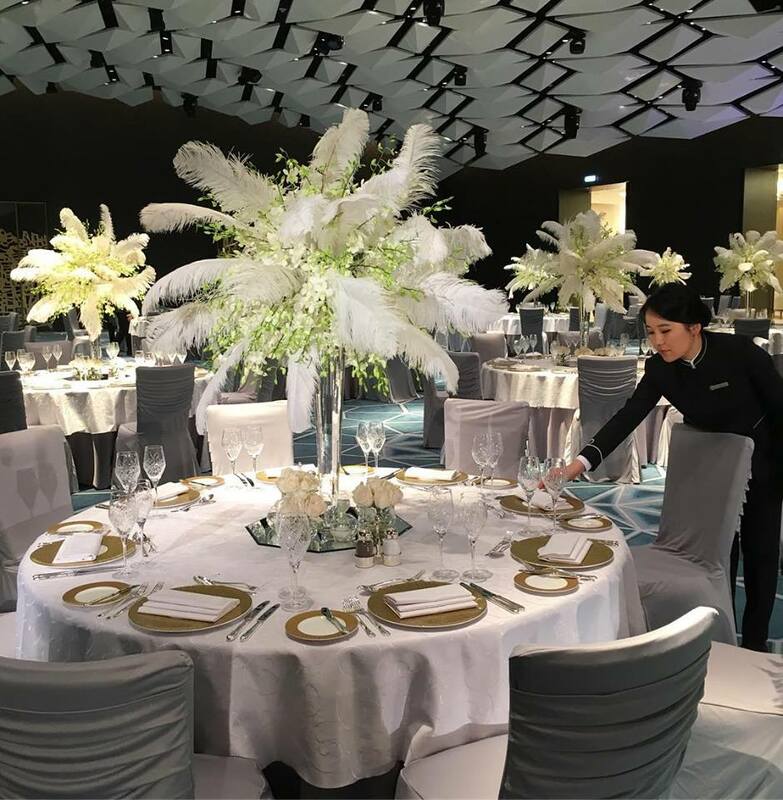 Combining beauty and prestige for wedding celebrations, Four Seasons Hotel Kuwait at Burj Alshaya offers a choice of 2 spectacular ballrooms. A glamorous modern style is detailed with distinctive arabesque design. On the ground floor, Al Mirqab Ballroom inspires grand arrivals with a direct entrance from Al Soor Street. Elevated on the first floor, Al Bidaa Ballroom features windows for natural daylight, while draperies can provide a total black-out. The largest of the 2 ballrooms is Al Bidaa which has a total area of 1350 square meters, it can seat 880 guests in banquet style and can host 1350 guests for a cocktail reception. Al Mirqab ballroom is 716 square meters, it seats 450 guests in banquet setup and hosts 700 guests for a cocktail reception. Beyond the 2 stylish ballrooms the Four Seasons Kuwait offers a beauty salon and a bridal suite in the spa, as well as, a professional photography studio. With wedding expertise renowned around the globe, Four Seasons creates unforgettable magic for you and all your guests. The Palms Beach Hotel & Spa is a 5-star city resort hotel, on the shores of the Arabian Gulf, South Coast of Kuwait City. Nassima Ballroom is the newest ballroom in Kuwait. It is 1150 square meters in area, which can accommodate 850 seated guests in banquet style and hosts up to 2000 guests for a cocktail reception. Al Nassima Ballroom is an ideal venue for your memorable events with distinctive luxurious modern decoration. All facilities are equipped with cutting-edge technology equipped with state of the art audio/visual facilities and high-speed broadband internet. For over 30 years, The Regency has established itself as an iconic social landmark, showcasing and hosting the most magnificent weddings in Kuwait. The ballrooms are elegantly spacious with an attention to detail that leaves lasting impressions on each of its guests. The Maha Ballroom is luxury on a grand scale, located on the ground floor of the convention center, this column-free 870 square meter ballroom is connected to 3 smaller meeting rooms and a welcoming pre-function area. Up to 1000 guests can be accommodated depending on your preferred setup. The Futouh Ballroom is identical to the Maha Ballroom, adding to the convention center’s offerings with only a colour scheme variation. As each couple approaches their wedding day, the newly established wedding division at The Regency offers the finest services imaginable to help you make your special day perfect. From customizable dining options for the reception, including buffet, family style, set menu, and silver service, to assist in selecting the finest linens, each moment is thoughtfully curated. Discover one of the finest luxury hotels in Kuwait for weddings, social events and theme parties at the JW Marriot Hotel Kuwait City. Al Thuraya Ballroom, 794 square meters, can host weddings, social events up to 1500 guests in a cocktail reception style. Al Jahra Ballroom is 750 square meters which can seat 450 wedding guests in banquet style and 1500 wedding guests for a cocktail reception. Events by JW, provide full-service production & catering for any event within or outside the hotel. 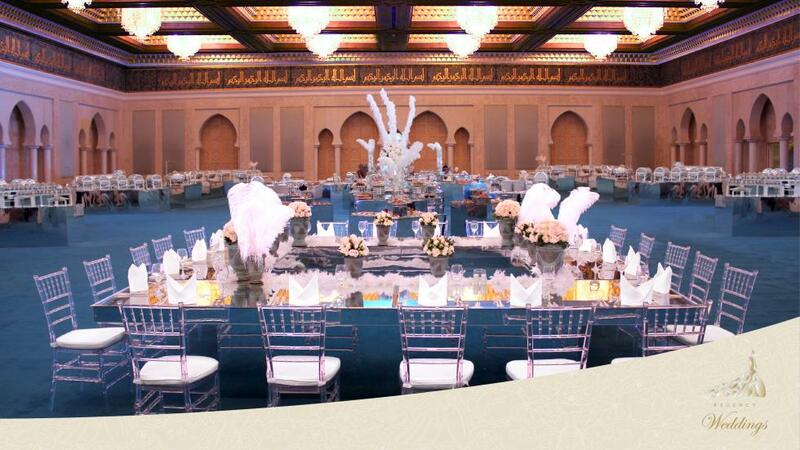 Jumeirah Messilah Beach Hotel & Spa in Kuwait is an ideal venue to host lavish weddings in Kuwait. The Badriah Ballroom is a great choice if you are looking to host a glamorous wedding or a cocktail reception. It is a sophisticated space with luxurious fittings, walnut paneling with a high ceiling adorned by modern chandeliers. Badriah Ballroom can be divided into 3 separate areas, if needed, with great audio-visual equipment. Guests can enter the ballroom from either the dedicated entrance or from the main hotel lobby leading down into the foyer. The Messilah Ballroom is located on the second floor; it is equipped with built-in screens and projectors with remote controlled sound and lights. The hotel's special highlights include state-of-the-art banqueting facilities, a bridal suite and a flexible meeting and exhibition space with two meeting halls and five break-out rooms. The dedicated event management team will always be there to help you plan and execute a perfect wedding.